There have been a number of Lime Kilns in the village over the years but only one remains. It can be found along Baden Hill Road. 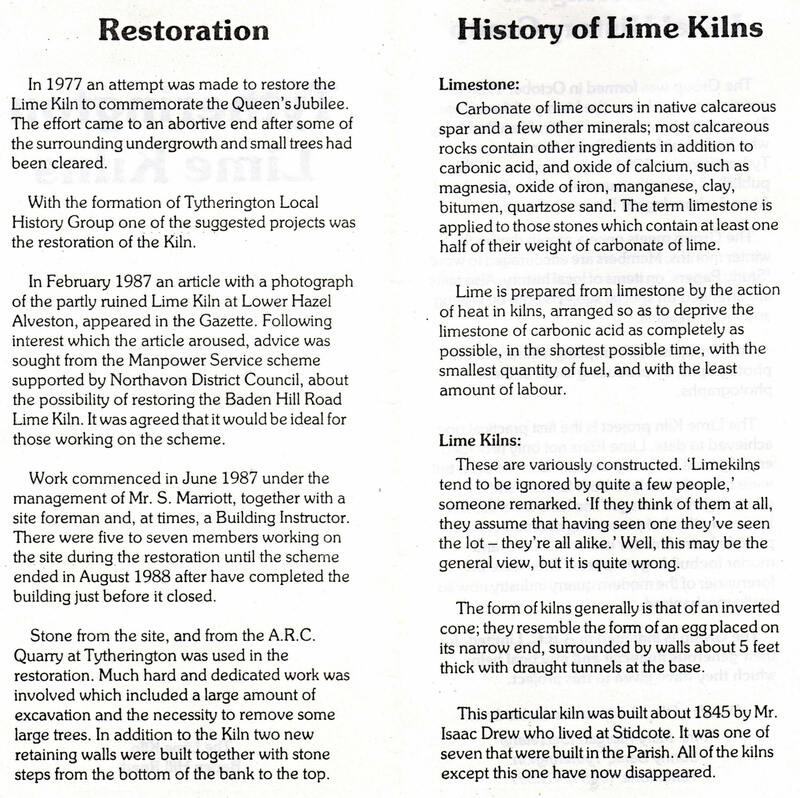 Lime was extensively used earlier, as a constituent of mortar in building; as a moderator of acidity in fields that had been over-grazed; as whitewash in keeping farms and cottages, and especially dairies, clean and hygienic; as a sweetner for privies, in ridding hides of unwanted fur and as quicklime for burying dead animals. 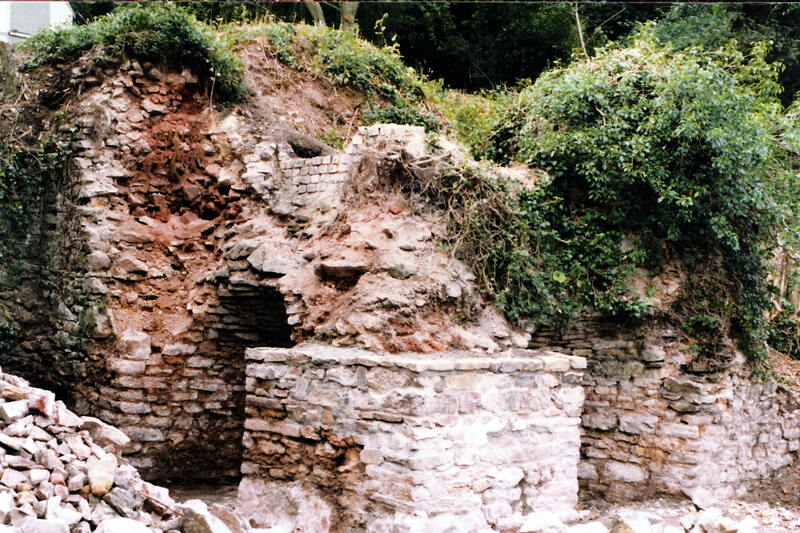 Below are photos of the lime kiln. The poem is by Tytherington poet Alice Johnson. 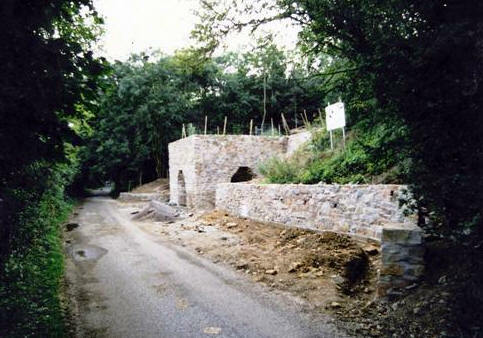 Built about 1845 the lime kiln fell into complete disrepair but was restored in the late 1980's thanks mainly to the indefatigable efforts of the late Ted Oakey, with many other villagers lending a hand. Thirty years later in March 2017 the kiln was given a much needed make-over. 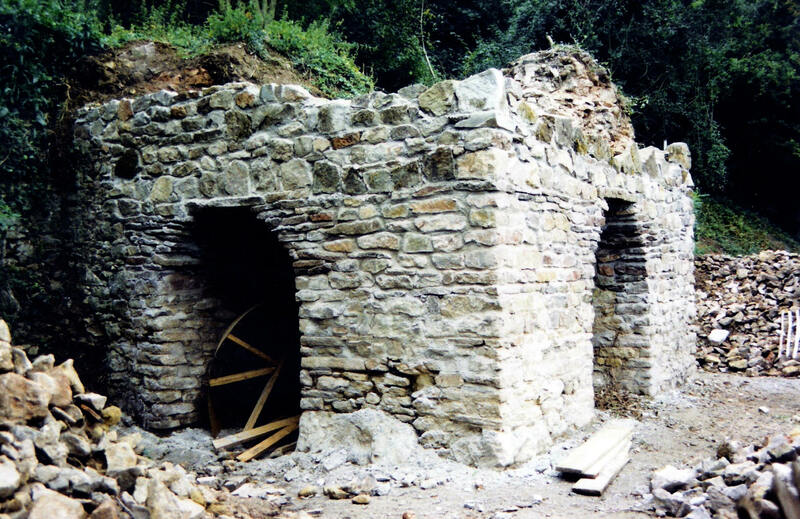 The Lime Kiln during restoration in 1987. Well it's pretty obvious that in Tytherington never underestimate our forefathers - by golly they had it there and they realised that as they were cultivating the land it had to be purified. They were putting muck in and it would get sour so they had to do something about it, and so what happened? 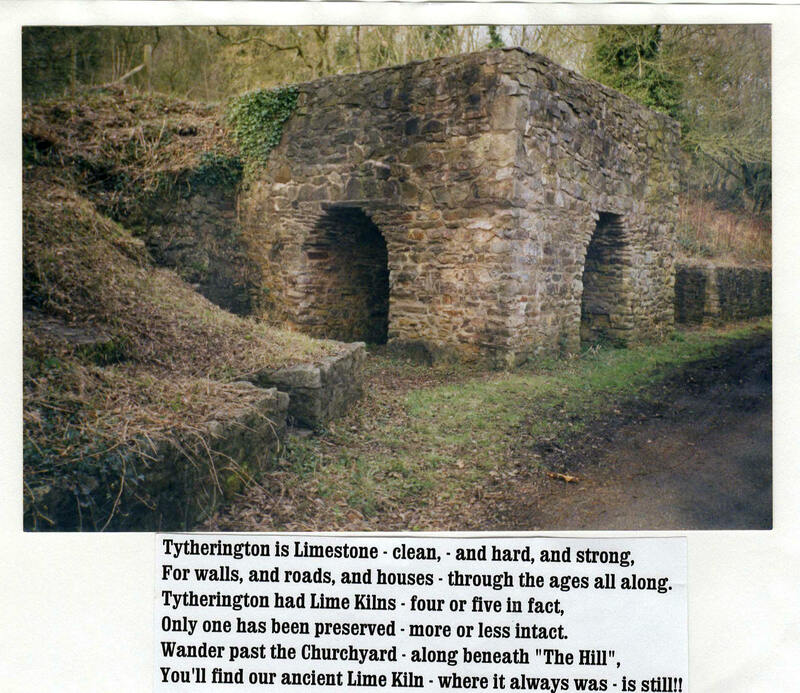 Tytherington had limestone so you burnt lime or you burnt stone to get lime. Well now I know about four (limekilns) in Tytherington or where there has been four, although Ted Oakey thinks there were seven. Well you will see one under Tytherington Hill which is nearly hit to pieces (now restored) there was one going up Stowell Hill towards the Vicarage, there was one on Itchington Field, there was one in Mr Matthews field up towards the slope of Baden Hill and I believe there is quite a strong possibility there was one up the New Road where you'll see a dip by Ernest Matthew's sheds in there in the wood. So lime and stone was being burnt in Tytherington, and that was making lime for purifying the land so the seasons could go on. So that was the start. Frank Pitt told me that in the records of the Church there was something about a sailor being found along by the limekiln in Tytherington in the middle of the 17th century. Well it's obvious that lime kilns go way back.